The 2011 American Silver Eagle Bullion marks the twenty-sixth year for the series which was introduced in 1986 as a result of the Liberty Coin Act of 1985 (Public Law 99-61). Each of these coins is struck from one ounce of .999 fine silver. The government of the United States guarantees the weight and content of each 2011 Silver Eagle, making them an official silver bullion coin of the United States of America and an ideal investment devices. That guarantee even allows them to be added to a person’s Individual Retirement Account (IRA). 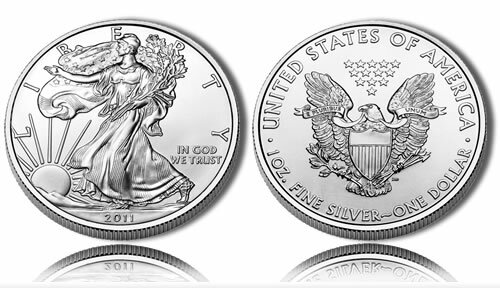 Like all US Mint bullion products, the 2011 Silver Eagle bullion coin is not sold directly to the public by the agency. Instead, the US Mint uses a network of authorized purchasers. This network orders bullion coins in massive quantities from the US Mint (usually beginning as early as late December of a prior year), then resells them to the public in smaller lots (beginning in January of the current year). Each silver coin is priced with a small premium on top of the current spot price of the precious metal contained within it. Similarly, each bullion Silver Eagle will always have an intrinsic melt value associated with it. This melt value is roughly equal to the current market price of the ounce of silver contained within it. Buyers will expect to pay slightly more than that melt value in order to obtain it, whereas sellers should expect to receive slightly less. Each coin will always have intrinsic melt values equal to the one ounce of silver it contains. For example, if silver is currently trading on the market for $26 an ounce, each 2010 Silver Eagle coin would have a melt value of $26. Buyers will pay a premium above this price, while sellers will receive a bit under it. Collectors are also interested in the bullion Silver Eagles, but at a somewhat different level than the collector proof or uncirculated versions also offered by the US Mint during most years. As such, some of the bullion coins will attain a much higher numismatic value than their melt value would indicate, especially if one is slabbed and graded highly by an independent third-party grading service. The obverse of each 2011 Silver Eagle contains what is considered as one of the most beautiful designs ever to grace an American coin. It is Adolph A Weinman’s "Walking Liberty" that was first seen on the Walking Liberty Half Dollar that appeared from 1916-1947. Also shown are the inscriptions of LIBERTY, IN GOD WE TRUST and the year. John Mercanti’s Heraldic Eagle with Shield is shown on the reverse of the coin along with the inscription of E PLURIBUS UNUM, UNITED STATES OF AMERICA, 1 OZ. FINE SILVER and ONE DOLLAR. Demand for bullion Silver Eagles has typically been several million annually. However, that number spiked significantly in 2008 when the total number sold attained a new annual record. That record was then shattered by both 2009 and then 2010 as investors turned to the investment grade coins during uncertain economic conditions. In fact, the US Mint struggled to keep up with the demand for the bullion Silver Eagles during those years, as it is required to do so by law. So many were ordered in 2009 that the Mint was forced to cancel production of the Uncirculated and Proof Silver Eagle that year, diverting all available planchets to bullion production instead. It marked the first time an annual version of the Proof Silver Eagle was not struck since the program debuted in 1986. The collector uncirculated coin was also canceled in 2010. By 2011, the Mint had drastically improved its supply of blank planchets allowing the facility to once again strike both the proof and uncirculated Eagles despite record demand continuing for the bullion version of the coin. Up-to-date sales information on the series can be found on the silver coins sales figures page. Melt values based on the current market for silver is also shown. NO PORTION OF THIS SITE MAY BE REPRODUCED OR COPIED WITHOUT WRITTEN PERMISSION. P.O. BOX 691701 SAN ANTONIO, TX 78269. ANY USE OUTSIDE THE GIVEN PERMISSIONS CONSTITUTES COPYRIGHT VIOLATION. All data and information provided on this site is for informational purposes only. CoinNews Media Group LLC makes no representations as to accuracy, completeness, correctness, suitability, or validity of any information on this site and will not be liable for any errors, omissions, or delays in this information or any losses, injuries, or damages arising from its display or use. All information is provided on an as-is basis.